Search engines care a lot if your website is secure and safe for your customers. So the question for many is how to boost website SEO, but it should be also how to maintain the ranking. I know that many people don’t understand why their website is being targeted in the first place. Therefore never feel about security as anything critically important (until they get hacked). But there is more in that than just spending time and money on feeling safe. Better Security = More Traffic & Bigger Sales! This is the basics! Moving over to a secure connection (HTTPS) is essential. Google has officially confirmed that they boost rankings for HTTPS sites already in 2014. Early 2017, Firefox and Google Chrome started to call HTTP connections insecure. You can see it by yourself – all the regular HTTP pages with a login functionality are marked as “Not Secure”. Search engines and web browsers are giving out a clear sign. Your website will have a better reputation and will be positioned higher in search engine results if you take care of your visitor’s safety. If not… well, it’s your own loss. No Security = Loss in Traffic & Drop in Revenue! There are many reasons why search engines can apply penalties (negative website SEO) to your website ranking. If you don’t take care about security, you might end up with your site being wiped from search engine result or even have it completely blocked. Honestly, this makes sense. If you don’t care about your website and you don’t care about your visitors — why should Google or any other search engine care about you? Still don’t care? Well, get used to the website SEO penalties! Image from an article where a website owner had to confront the consequences. Snapshot from defaced websites on Google search. A major issue among websites running on outdated CMSs like WordPress, Joomla, Drupal and so on. The issue with the outdated software and lack of protection can make it easy for automated bots to attack your site and deface it with sometimes rude content that gets indexed by the search engines. Even if the search engine doesn’t apply a penalty for that, your visitors definitely will! Snapshot from Google. Website SEO Spam on random websites. If you lack protection and you frequently get comment spam under your website posts, keep in mind that Google will hand out a ranking penalty (User-Generated Spam penalty) just for that. It doesn’t mean you’re a spammer — but your site users are, so it’s completely up to you to clean up spammy content people and bots post to your website. Website SEO Spam is probably the most common issue when we talk about insecure and unprotected websites. SEO spam can be injected via commenting areas and if the website has been compromised by the hacker, they can even create sub-pages. They can also hide links and keywords into the source code, making it invisible for you to see, but accessible to search-engine crawlers. Screenshot of a malware-infected website. 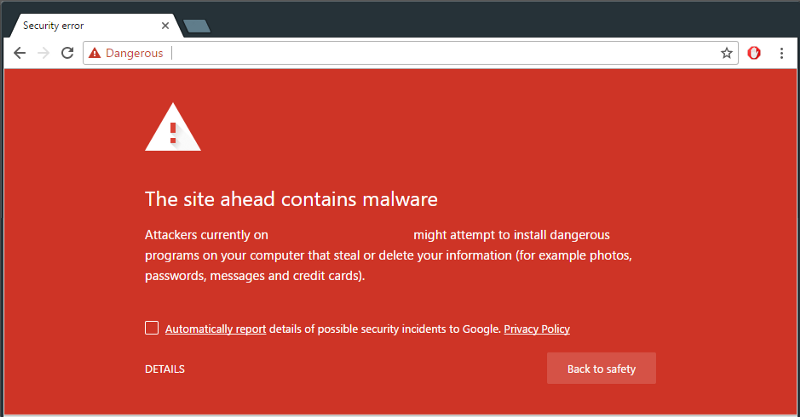 More and more sites which get infected with malware will be detected by the search engines. The site will be added to numerous blacklists, the website will be marked as dangerous and the access will be blocked by the browsers and by different antivirus vendors. It’s one of the worst-case scenarios, but it’s far from being rare. It’s not just about cleaning up your website to get the ranking back, you need to get your site removed from every blacklist. Go and ask for a search engine to re-index the whole site. Without talking about the complexity of malware cleanup, the whole process of recovering the site can take some considerable amount of time. This can literally shut down your business! So, which one do you prefer: no ranking or good ranking? It’s all up to you! You can choose Negative website SEO by closing this article and thinking: “Pfff, Why the hell would anyone hack my small website?”. Start from the basics and secure your site — don’t use default usernames like admin and start using passphrases rather than passwords. Keep your software updated and don’t download themes and plugins from un-trusted sources. Building a wall around a trojan horse and yourself doesn’t really make sense. If you haven’t transferred your website from HTTP to HTTPS yet, do it now. It’s FREE! Make sure to know your hosting provider. Stay away from free-hostings and look for the reputation and customer feedback. You probably don’t visit your website every day, so go ahead and ask for the free 14-day trial. Sometimes it might be surprising what you‘ve had on your site for months. Most of the attacks against websites are automated – do the same – automate website security! Use a web application firewall. The most important step is that don’t leave it for tomorrow, do it now!